Flatland is a “noir tale of revenge, political uprising, and breaking your enemies into tiny pieces”, which sounds normal, right? Well, here’s what makes it both zany and quite intriguing: the protagonist is a triangle, on a mission to become a polygon! Needless to say, your disbelief needs to be suspended somewhat, to get the most out of the story told here, since, well, everyone is a two-dimensional shape. 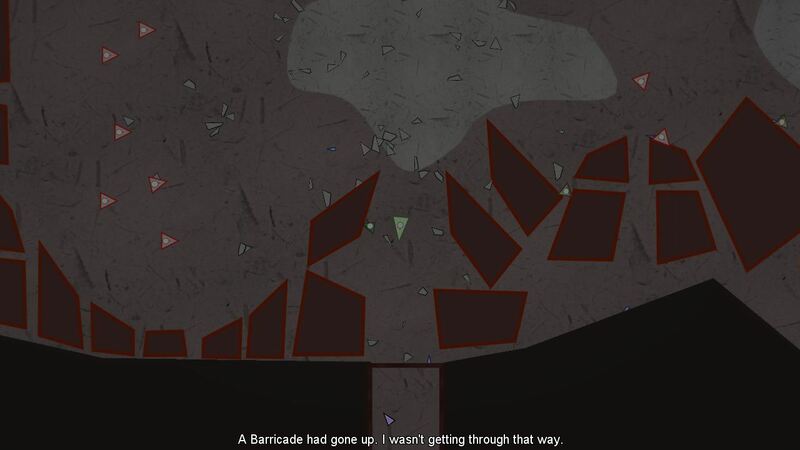 While I’m not entirely sure what’s going on as I ventured through the crowded streets, avoiding soldiers (red shapes), each collision causing a piece of my triangular body to break off, one thing was certain: I was not on my own in this struggle. To reveal more would be to spoil the story, which is told in a surprising manner: as I crossed certain invisible barriers in each area and/or did specific things, I was treated to another bit of dialogue (note: I’m fairly certain these are the thoughts of your character). Definitely prefer this method over cut-scenes, as it allowed the pace to remain constant – just like it should be in a game like this. Originally a Ludum Dare creation back in 2011 under the name Escape from Flatland: an Adventure of Two Dimensions, this triangle is no stranger to the spotlight, and now it’s actually… completely free! No strings or nasty DRM attached. What, not enough? Alright, how about a bunch of extras, released for the occasion, then? Among these is a video series, documenting the early days of SeeThrough Studios, the Flatland soundtrack and an e-book which chronicles Flatland: Fallen Angle‘s development. Certainly a worthy read for those with an interest in video game development, even if it’s just general curiosity. Just don’t forget to show their next game, Particulars, some Greenlight love, eh? It’s a big part of why Flatland is free, after all. Since I know there are those who just want to take the game for a spin, this is the place to go for that. It comes in Windows, Mac and web (Kongregate) flavors, so pick your poison and get to playing.